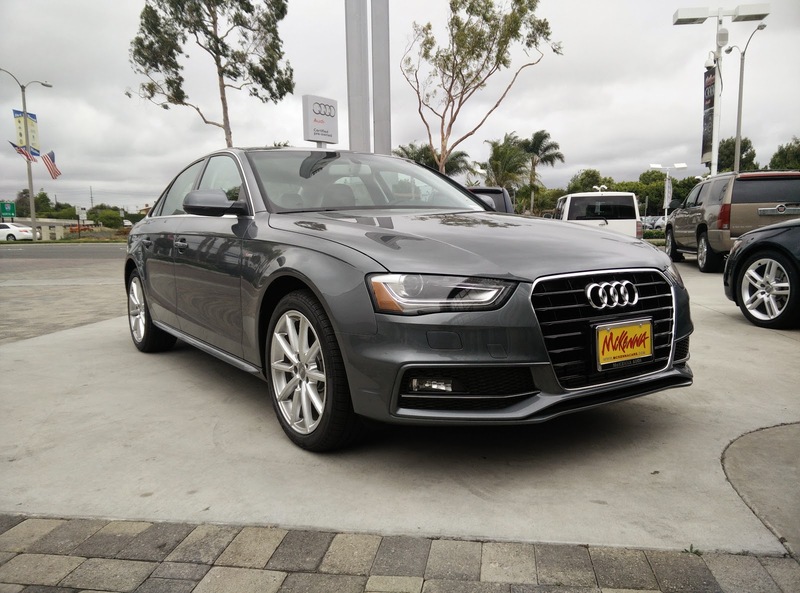 My experience with the Audi A4 in the past has been relatively positive. Thanks to the car rental company, Silvercar, I have gotten to spend extended time with the A4. 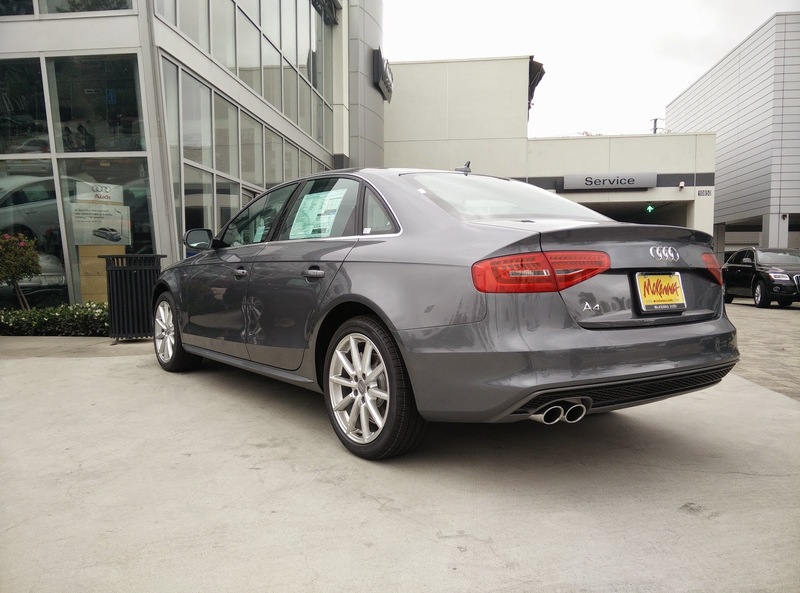 However, all of the A4s in Silvercar's fleet are equipped with Audi's Quattro all-wheel drive system. Seeing as how every other mid-size luxury car we have tested thus far have been two wheel drive, it would seem unfair to find a Quattro equipped A4. Besides, testing a front-wheel drive model will help not with just the car's fuel economy, but with its price as the A4 is not exactly the most cost efficient mid-size luxury car. And thus we run into a problem. Either Audi sells a ton of front-drive only cars, leaving only Quattro models in their inventory, or people only want Quattro cars, thus forcing Audi dealers to minimize the number of front-drive cars in their inventory. 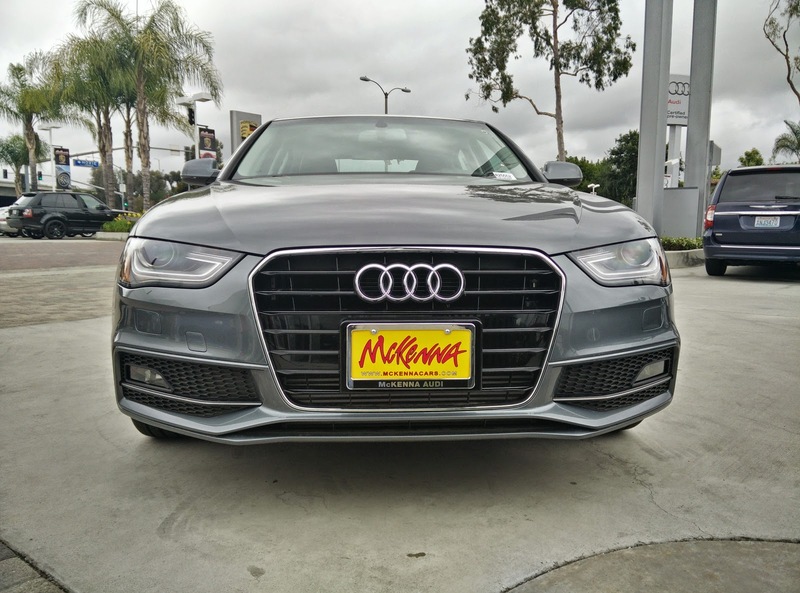 The Audi dealer we selected to visit was one of the largest in Southern California, yet they did not have a front-wheel drive A4 equipped as we were expecting. Instead, we had to settle for something close, which did mean the car was missing a few key pieces of equipment we were hoping it would have. Lack of equipment notwithstanding, would the front-wheel drive A4 drive as well as its all-wheel drive counterpart? Sadly, the answer is a resounding no. The FWD Audi A4 does not even come close to driving as well as the Quattro equipped variant, but we will get to that. Let us start with the car's looks. This generation of the A4 has been on the market for quite some time now. It is definitely due for a full model refresh soon, yet despite its age though, it still manages to look quite attractive. Compared to when Audi first started using the company's standard trapezoidal grill, the added sharp lines and edges in the front make the car look much more aggressive. There is just something oddly satisfying about the simplicity of the A4 that give it such a minimalist yet classy design. The optional 18 inch wheels look much sportier than the standard 17 inch wheels, but do not seem to fill out the wheel wells as much as I would hope. I guess it is not just a Honda/Acura exclusive issue. The A4 still has one of the better interiors in its class. Audi touts the use of real buck hide leather in all of its vehicles. While my untrained touch probably could not tell the difference, all I know is that the leather does feel quite plush. And the plastic? Sure, a majority of the car is covered in it like other cars in its class, and yes, it feels cheap as hell. The one thing Audi did well was to include aluminum trim that takes your focus off of how cheap feeling and looking the plastic is. If you are like me though, all the aluminum trim in the world is not going to prevent me from cringing every time I push a button on the console. Speaking of the console, I still dislike the MMI system with a great passion. It is so convoluted that I feel it cannot be safely operated unless the car is sitting still. Even if the car is at a complete stop, navigating through the menus is confusing. I watched my brother and the salesman spend five minutes fumbling through the menus to get to the vehicle settings before both of them gave up. So now we get to the real disappointing part about the A4. If you recall from my first review of the A4 that I rented from Silvercar, I thought the engine and eight-speed automatic were very well matched. At no point did I ever feel like there were dead spots in the powerband and the engine pulled incredibly smoothly. While you do get the exact same engine regardless of which wheels are being powered, you only get Audi's "multitronic" continuously variable transmission (CVT) as your transmission of choice with the front-wheel drive model. This was a lousy choice on Audi's part. The CVT is absolutely terrible. What was once a smooth and powerful engine has been turned into the laggiest, most gutless engine I have ever had the displeasure of testing. And to think that this problem could have been easily avoided if Audi had taken the time to adapt its eight-speed automatic for both front-drive and all-wheel drive use. Without Quattro, the handling of this car goes from pretty good to "are we sure this isn't a Volkswagen Jetta?" Yes, I know that the A4 is now built on its own platform, but without Quattro providing power to all four wheels, I really could not tell. The A4 is probably sprung and dampened the same across the entire lineup (aside from when specifically optioned otherwise), regardless of drive train configuration. This mean that the front-drive A4 went over bumps and potholes with the exact same level of comfort as its Quattro equipped counterpart. Problems start to happen when you try to push the car through a corner. Things get a little out of hand a lot quicker than I had thought it would. The amount of understeer is a little bit silly for a car that is supposed to be marketed as a sport sedan. It simply refuses to rotate into the turn if you are carrying any kind of speed. For whatever reason, steering and braking also seem to suffer without Quattro being present in the car. From what I can recall, the Quattro equipped model had steering that felt well weighted and somewhat communicative. Remove the Quattro, and steering suddenly starts off feather light and just does not weight up enough at speed. You can also pretty much forget about feeling any sort of communication from the front wheels through the steering wheel. Whatever magic voodoo Quattro has on the steering is completely gone in the front-drive model. Quattro's magic also seems to apply to the brakes as well because I found myself having to step a lot deeper into the pedal to get the car to stop than I had originally remembered. I can understand how all-wheel drive can have an effect on handling and possibly steering, but braking? If anything, I should not have to step on the brakes as hard because the car is lighter without the weight penalty from having an all-wheel drive system! Is Audi using a different master cylinder in the FWD versions of the car? This particular A4 is the second cheapest car in our roundup of mid-size luxury cars. It is cheaper for a reason though. It is missing a lot of bells and whistles that were available in most of the other cars we test drove. 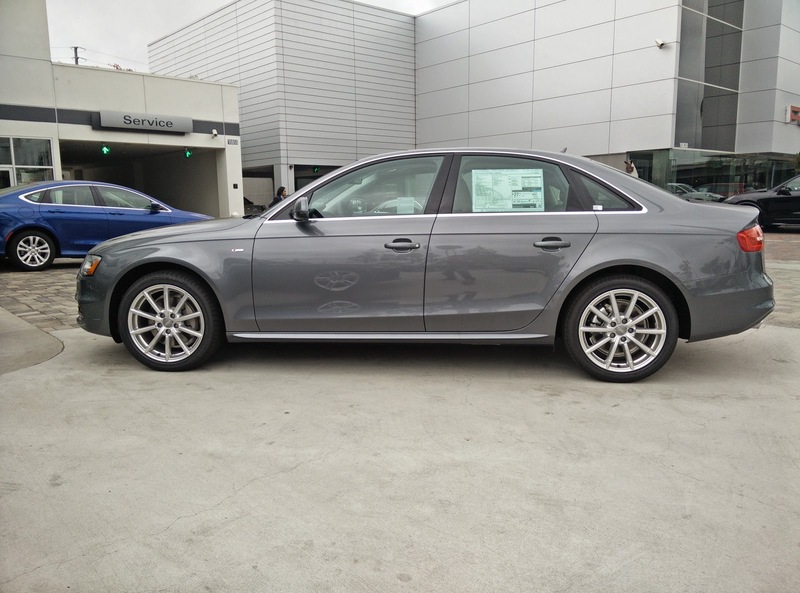 Things such as a backup camera, heated seats and various driver assist features were all absent from this particular A4. Could we have simply opted for a Quattro equipped A4 with all the bells and whistles? Of course we could have, but this car is already quite pricey for what you get, not to mention the terrible way it drives. Adding Quattro to the equation would just further jack up the price. 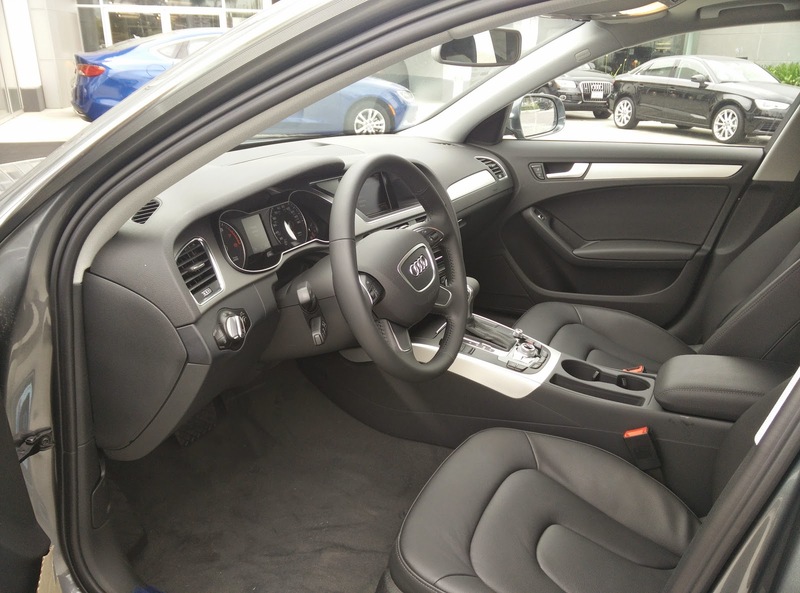 But, if buying any other brand of mid-size luxury vehicle is just simply not part of the equation, spend that few extra grand and get yourself a Quattro equipped A4. You may be out a few extra grand, and you may end up at the gas station more often, but you will much happier with the way the car drives and handles. *A special thanks to McKenna Audi for giving us time with their vehicle.